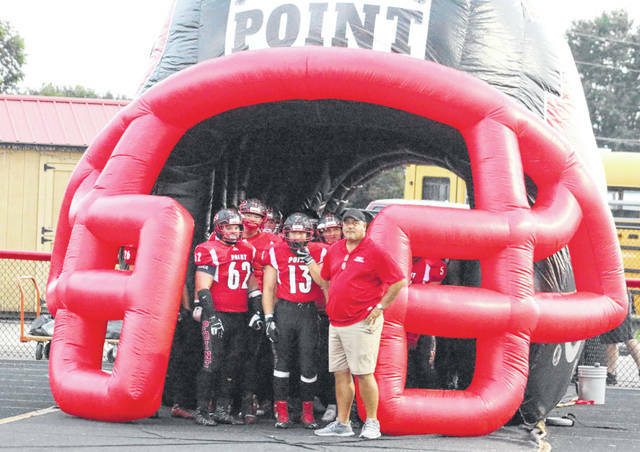 Point Pleasant head football coach David Darst stands with his team before they take the field during a Week 3 football contest against Warren at Ohio Valley Bank Track and Field in Point Pleasant, W.Va.
Last Game: Pikeville lost to Belfrey 36-21, in Pikeville; Point Pleasant defeated Herbert Hoover 53-21, in Point Pleasant. PHS offense last week: 272 rushing yards, 135 passing yards. PPHS offense last game: 331 rushing yards, 104 passing yards. PHS offensive leaders last week: QB Connor Roberts 12-of-21, 135 yards, 3INTs; RB Zack Roberts 29 carries, 127 yards, 2TDs; WR Kyle Watkins 5 receptions, 74 yards. PPHS offensive leaders last game: QB Cason Payne 7-of-9 112, 1TD; RB Cason Payne 9 carries, 118 yards, 2TDs; WR Josh Wamsley 3 receptions, 70 yards, 1TD. PHS defense last week: 368 rushing yards, 0 passing yards. PPHS defense last game: 213 rushing yards, 50 passing yards. 1. The Big Blacks are facing a team from the Bluegrass State for the first time since 1961. PPHS is 4-6-1 in all-time games against teams from Kentucky. 2. Point Pleasant enters the week in the fifth spot in the WVSSAC Class AA playoff rankings. A total of nine Class AA teams enter Week 4 with an unbeaten record. At 214 points scored, the Big Blacks are the highest scoring team in the state entering Week 5. Martinsburg, at 207, is the only other team to have at least 200. 3. The Big Blacks have rushed for 21 touchdowns this season, while passing for seven, and scoring once each on defense and special teams. PPHS is 27 yards away from the 2,000-yard mark for the season. 4. The Panthers have scored 20 offensive touchdowns this season, seven through the air and 13 on the ground. PHS has also rushed for 943 of its 1.539 yards this fall. 5. This game will be the Wendy’s Friday Night Rivals Game of the Week. Mark Martin of WCHS will be calling the game live on television, and the game will also be available at wchstv.com on the internet. Check local listings for channel information. Last Game: Wahama lost to Belpre 41-22, in Mason; Federal Hocking lost to South Gallia 47-6, in Stewart. Last meeting between the teams: Sept. 22, 2017. Wahama won 28-8 in Mason. Current head-to-head streak: Wahama has won 9 straight. FHHS offense last game: 76 rushing yards, 33 passing yards. WHS offensive leaders last week: N/A. FHHS offensive leaders last game: QB Hunter Smith 3-of-12, 33 yards, 1INT; RB Donnie McCain 10 carries, 47 yards; WR Owen Roark 3 receptions, 33 yards. WHS defense last week: 440 rushing yards, 0 passing yards. FHHS defense last game: 437 rushing yards, 96 passing yards. 1. Wahama is 30-2-2 against Federal Hocking in all-time meetings, with the Lancers last defeating WHS on Sept. 2, 2006, by a 14-7 count in Mason. The White Falcons claimed a 20-0 victory in their last trip to Stewart. 2. The White Falcons finally broke through in the scoring column last week, with Tanner Smith, Brennan Grate and Abram Pauley each rushing for a touchdown. 3. Last week, the White Falcons gave up a defensive score for the second straight week. After having a fumble returned for a touchdown in Week 3, the WHS offense allowed a pick-6 last Friday. 4. Federal Hocking’s scheduled Week 4 contest with Fort Frye was cancelled, due to Lancer injuries. The Lancers enter this week with a 34-game losing skid overall, with a 27-game losing skid in the TVC Hocking. 5. Wahama is one of 11 teams in Class A that enter Week 5 without a victory. The White Falcons are 0-4 for the third time in the last 20 seasons, but WHS hasn’t lost five in a row to start the year in that time. Last Week: Van lost to Lincoln County 60-0, in Van; Hannan lost to Hundred, 42-26, in Ashton. Last meeting between the teams: Oct. 21, 2011. Van won 42-6 in Ashton. Current head-to-head streak: Van has won 14 straight. VHS offense last week: N/A. HHS offense last week: 51 rushing yards, 271 passing yards. VHS offensive leaders last week: N/A. HHS offensive leaders last week: QB Matthew Qualls 9-of-22, 271 yards, 3TDs, 2INTs; RB Elijah Williams 6 carries, 65 yards; WR Andrew Gillispie 5 receptions, 198 yards, 2TDs. VHS defense last week: N/A. HHS defense last week: 497 rushing yards, 3 passing yards. 1. The Bulldogs have won all-14 matchups in the series between these teams, which began in 1948. The teams met for six straight season between 2006-and-2011, with VHS winning by an average of 33.8 points in those meetings. 2. Hannan is looking to snap a nine-game losing skid. The 26 points scored by the Wildcats last Saturday is the most points in a game during their current skid. 3. HHS is one of 20 teams in Class A with a losing record entering Week 5. Van is one of 17 teams in Class A the enter the week above .500. 4. Andrew Gillispie found the end zone twice for the Wildcats last week, while Skylar Nance and Dylan Starkey each scored once. Van was shut out a week ago, the first time the Bulldogs have been blanked since Week 5 of last season. 5. The Wildcats won’t be home again for nearly a month, as their next contest in Ashton is scheduled for Oct. 19 against Buffalo. HHS has dropped four straight home games.